Cheats! - The Odyssey² Homepage! Odyssey² cheats and strategies to maximize your scores! Unlisted Stock: Here's a true programming glitch. Enter a stock name into one of your accounts, and wait for the price to be displayed. Do not press ENTER yet. Scroll to another account, and the stock and price you just entered will be displayed. Press CLEAR to clear this account. Then scroll back to the account where you first entered the stock. It will be blank except for the price, which will be the same as the stock you entered. Enter a number of shares to purchase and press ENTER. You will end up with shares of an unlisted stock wth a garbled name that looks something like this: BM.Y.. The value of BM.Y. is equal to IBM's, but the game thinks you purchased it at the value of the first stock you typed in. So, if the purchase price of BM.Y. is a lot lower than IBM's, you make free profit! NOTE: If the stock you used is bankrupt, you won't get any money for selling it. Keep Selling: Want to make cash fast? This trick won't help you if you're playing an actual game, but if you have ever wanted to "buy low and sell high," this is for you. First, you need to wait until at least one stock goes bankrupt (falls to a worth of 00). Buy a lot (and I mean a lot) of the bankrupt stock. By this time, other stocks should be very low as well. When a positive News Flash breaks, such as the one about electronic foot massagers, buy a lot of shares of a very low-value stock (but not a bankrupt one). Then, start selling off your shares of bankrupt stock. You won't make or lose any money, but while you're keeping the game busy by selling, the News Flash won't change! Your other stock will continue to rise higher and higher, all the way up to 99. Then sell it and watch the bucks roll in! Slow It Down: If you hold down '1' and hit Reset, the game plays at half-speed. This is without a doubt one of the worst programming glitches ever to appear in a video game. 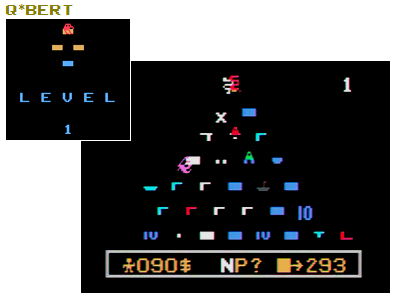 The object of this Videopac release is to maneuver your cursor through a maze to the right side of the screen. To get there fast, just push your cursor against the top of the maze. You'll pass right through the wall, actually moving outside of the maze, and can move over to the right side of the screen at your leisure. Better yet, just go to the closer left side of the screen, and you'll have completed the maze in almost no time! The Key to Survival: If you have a Key, and are about to be run down by a boulder, make a jump toward the nearest door. If you reach the door, you'll survive even if the boulder hits you. This game has so many quirks that I've dedicated an entire page to it! Please check out the Showdown In-Depth Review, and make sure to shoot some androids while you're there. Warning: This trick is easy to do but could ruin your enjoyment of the game! This trick will work only on game variation 0 (zero). You will also need The Voice module for it to work. First, you need to hit your opponent's castle. The moment the explosion starts, press and hold your joystick. The moment the explosion stops, release it. Direct hit! You'll win in no time! There are many ways to cheat in this game. Most involve mastering this simple technique: Run into a vertical wall and hold the joystick toward it, so as to keep bouncing against the wall. While holding the joystick, push Up or Down quickly and let go of the joystick. If you timed it right, your man will start to bounce up or down against the wall by himself (if you pressed Up, he will move down, and vice versa). Now, while clinging to the wall, if your man comes into contact with a horizontal wall, he will pass right through it (up or down) and keep clinging to the vertical wall. If your man passes through the top or bottom of the screen, he will return to his starting position. Holding down the button will make your man bounce up or down faster. This is a great way to avoid the robots! This technique has a unique application in mazes that have a vertical wall protruding up from the right side of the "cash box," as shown in the diagram. The "cash box" is my name for the section at the bottom of the screen where the numbers count down. Bounce against the protruding wall from the left (that is, you should hold the joystick to the Right to run into it). Perform the technique described above – just make sure to press Up, so you'll start bouncing down. You'll pass through the top of the "cash box;" press Left when you clear the top wall and you'll walk into the box! While in the box you're completely safe from robots. You can walk into the countdown numbers, but be careful: Sometimes, walking through the numbers will cause you to lose money, as if you were tagged by one of the robots. But if you're in an income round and you've already got your white robot, walking through the numbers can sometimes cause you to "collect" the second robot as well, thereby keeping your opponent from getting it. Unfortunately, if you do "collect" the second robot, you don't get any additional income. To exit the box, press Down. Do you have any strategies or game cheats for Odyssey² games? Send 'em to me!